The indoor pool is open all year round. Hours of operation are listed below. The pool is heated to a temperature of 31 degrees. This is monitored five times per day to ensure the temperature is maintained and stable. The outdoor pool is opened from October to April each year for summer. Hours of operation are listed below. The pool is heated to a temperature of 26 degrees. This is monitored five times per day to ensure the temperature is maintained and stable. *Per Entry 2 Adult + Anybody living at the address that is listed on the current Medicare card. * Learn to Swim - 30 Minute lessons once per week. 10 week term payable upfront. Includes pool entry fee for child (U/12yr) + one supervising parent or guardian. A number of strict measures have been put in place to avoid possible disease transmission after faecal and vomit incidents have closed the pool. The particular disease of concern is called cryptosporidium, which is a diarrhoeal disease infecting the intestine. Cryptosporidium or ‘Crypto’ is present in the faeces matter of already infected humans. It is spread when the parasite is ingested. you have cryptosporidiosis or germs like E.coli, shigella and viruses, which are transmitted through the faecal-oral route. They are highly contagious and spread by people accidentally swallowing pool water that has been contaminated. This causes people to be sick with symptoms such as diarrhoea, nausea, vomiting, abdominal cramps and fever. ‘Crypto’ can survive in a swimming pool for weeks thereby infecting swimmers and causing large disease outbreaks. It is therefore vital that swimmers don’t introduce the bug into our pools in the first place. These incidences are a disappointment and inconvenient for families. JM Robson Aquatic Centre enforces a ‘no nappy – no swim’ for under 3’s – no exceptions. This also applies to any children over the age of 3 years who are not completely toilet trained. Council reserves the right to ask any person that is not complying with this policy to exit the pool. This policy is in place to ensure the highest possible water quality for our patrons. Firmly fitting water tight swim pants (Happy Nappy) MUST be worn to prevent accidental contamination of the pool. This is in ADDITION to any disposable aqua nappy that is worn underneath. However swimming nappies should not replace regular bathroom breaks. Check the nappy regularly and change when required. Disposable aqua nappies are available for $2 on the pool deck for the convenience of families. Parents and carers have a key role to play in ensuring pools remain safe for everyone by ensuring that non-toilet trained children do not have toileting accidents in the pool. The JM Robson Aquatic Centre now offers party packages for kids birthday parties. Parties in the facility include a decorated party room and qualified instructor(s) that facilitate structured games for children to participate in. Parties run for 2 hours, with the first hour and a half dedicated to pool time fun and the last half hour for food and cake. At the end of the party all children will leave with a lolly bag. 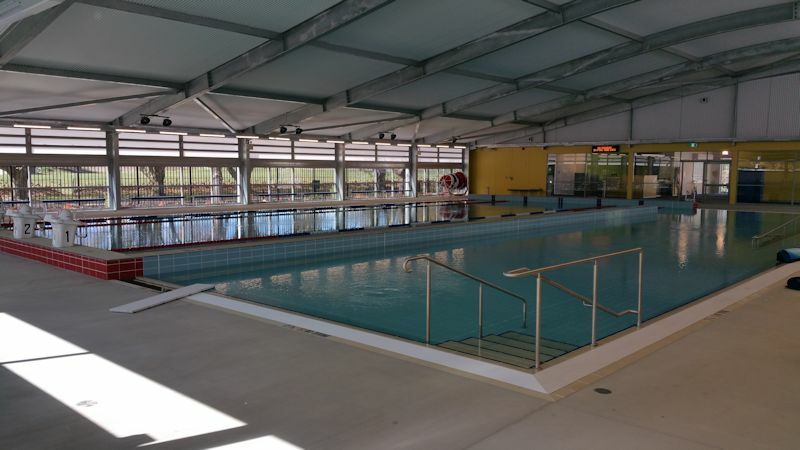 JM Robson Aquatic Centre Swim School is recognised as one of Lithgow’s best swim schools and leads the industry in teaching methodology and customer care. We offer classes for infants through to the more advanced swimmer. Our swim school program has been designed to allow for continuous improvement at age and ability-appropriate levels in small classes, with our highly qualified Austswim instructors. We also offer programs for the fitness swimmer and adult learn to swim. If you would like to apply for a season pass for 2018/2019 please download the form below and return to the aquatic centre with payment.